Written by Guest reviewer on Wednesday, 03 April 2019. Another discretionary food sporting a high Health Star Rating - 4.5 stars in this instance! 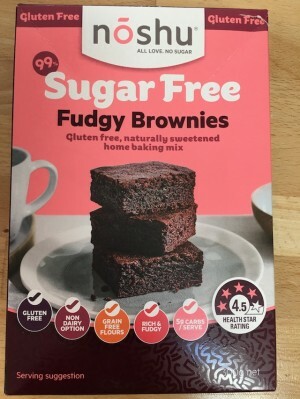 The pack states that these brownies are gluten-free, sugar-free, naturally sweetened, made from non-grain flours, contain no dairy and have less than 5g carbs per serve. So, are they worth the $7.50 price tag? Whatever their Health Star Rating, brownies are still a discretionary food. The recommended serve size is a 5cm square. Will anyone stop at one? And what about naturally sweetened? What does that mean? After all, sugar is a natural sweetener. In this case it means stevia and erythritol. We’ve written about stevia before here and erythritol is a sugar alcohol which is much sweeter than sugar with very few kilojoules/calories. If you eat too much, it can cause stomach issues but in small amounts it is usually well-tolerated. Here are the ingredients. While I’ve heard of chickpea flour (sometimes called besan) I’ve never heard of navy bean flour before. And what is ‘soluble corn fibre’? I’ve been told it’s a blend of mostly indigestible oligosaccharides with some digestible sugars depending on the purity. Whew! It’s a prebiotic made from the enzymatic hydrolysis of corn starch. It does increase the fibre content but also provides sweetness. This is in addition to erythritol and stevia. The instructions were easy to follow and the brownies require no special equipment, a hand whisk works fine. The mixture is fairly ‘goopy’, to use a technical expression, and you get a bit of a workout while mixing them. You can add whatever you like to the brownies, including chocolate chips or nuts but be aware that if you’re adding chocolate then you’re adding sugar too. I added chopped macadamias to my mix. I cooked them according to the instructions until they looked like they were getting very dry around the edges and so I reduced the temperature for the remainder of the time. After cooling for more than an hour, I sliced them but they were very, very 'fudgy' and I found them difficult to slice. The brownies tasted lovely. They didn’t have a stevia aftertaste which was good. I served them with some fresh raspberries but I found it difficult to stop at one, as did my guests. Expensive at $7.50 per pack unless you can find them on special. I found them a little too sweet. While the Noshu Brownies have gone to town on the health halo, they remain just a ‘sometime’ food. Yes, if you’re going to have a brownie then these are probably better for you than regular brownies but it’s not helping you reduce your sweet tooth and I challenge to only have JUST one! Thanks to Munaiba Khan, a retired Naturopath with an interest in nutrition for this snapshot.